This species has been widely cultivated as a garden ornamental, particularly in the temperate regions of Australia. Widely naturalised in southern and eastern Australia (i.e. in south-eastern Queensland, the coastal districts of southern and central New South Wales, the coastal districts of Victoria, Tasmania, many parts of South Australia, and the coastal districts of south-western and southern Western Australia). 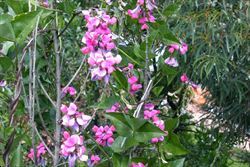 Also sparingly naturalised on Norfolk Island and naturalised overseas in New Zealand and south-western USA (i.e. California). 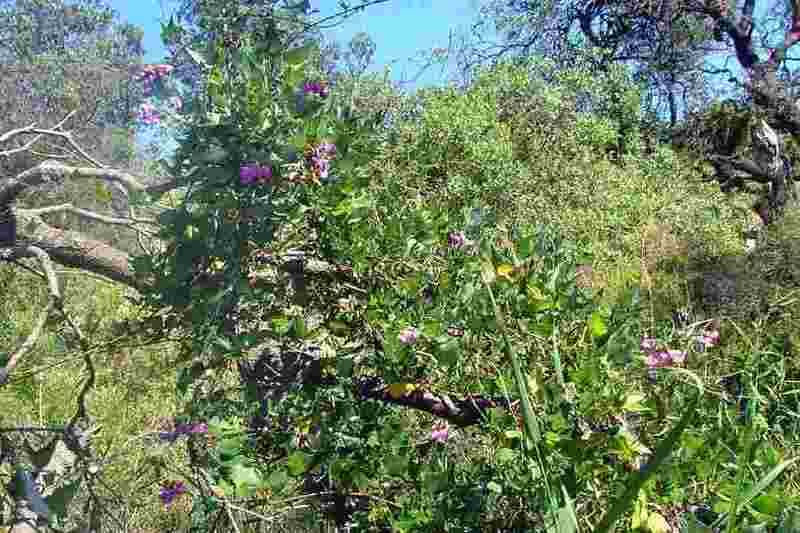 A weed of coastal environs, grasslands, heathland, open woodlands, forests, riparian habitats, disturbed sites, roadsides, gardens and waste areas in temperate and occasionally also sub-tropical regions. 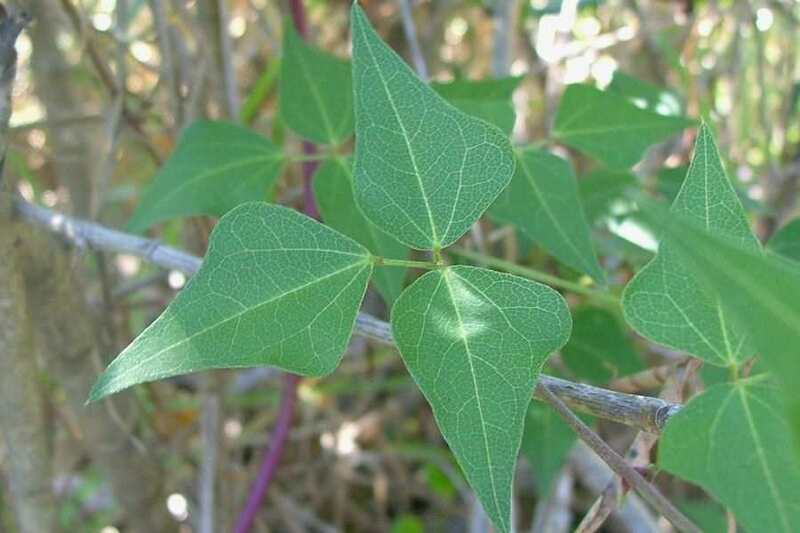 A climbing plant with stems up to 3 m long. It develops a woody taproot with age. 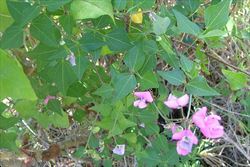 a climbing plant with wiry stems up to 3 m long. 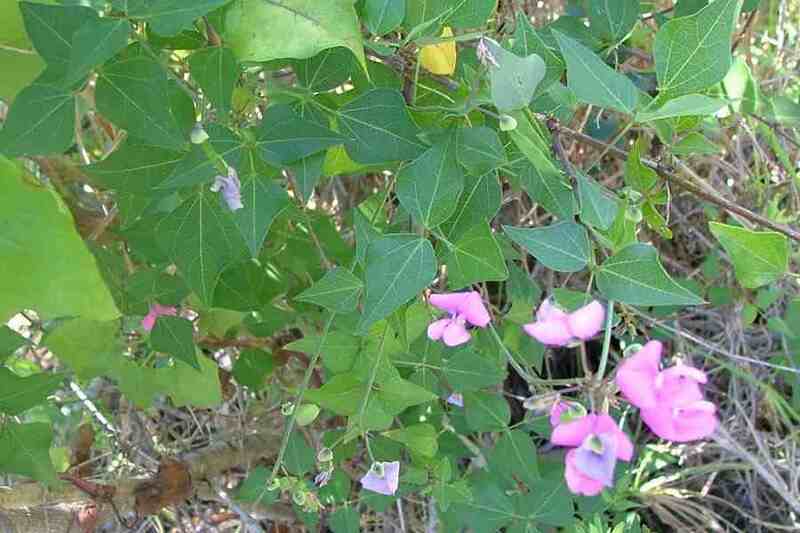 its leaves are compound and consist of three leaflets (3-10 cm long and 1.5-7 cm wide). 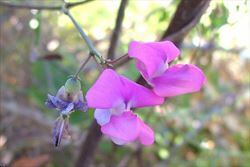 its pink, purple or white pea-shaped flowers (10-16 mm long) are arranged in elongated clusters. its pods are hairless, flattened and somewhat sickle-shaped (2-5 cm long and 5-10 mm wide). its seeds (3-4.5 mm long and 2.5-3 mm wide) are brown or black with a conspicuous white spot. 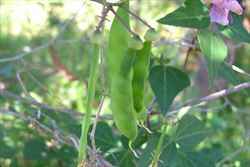 The stems are wiry and grow up to 3 m long. They are rounded or slightly flattened (i.e. compressed) and younger shoots are slightly hairy (i.e. puberulent). 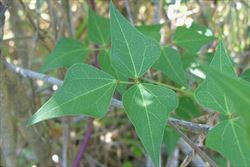 The leaves (6.5-16.5 cm long) are compound and consist of three leaflets (i.e. trifoliate). They are borne on stalks (i.e. 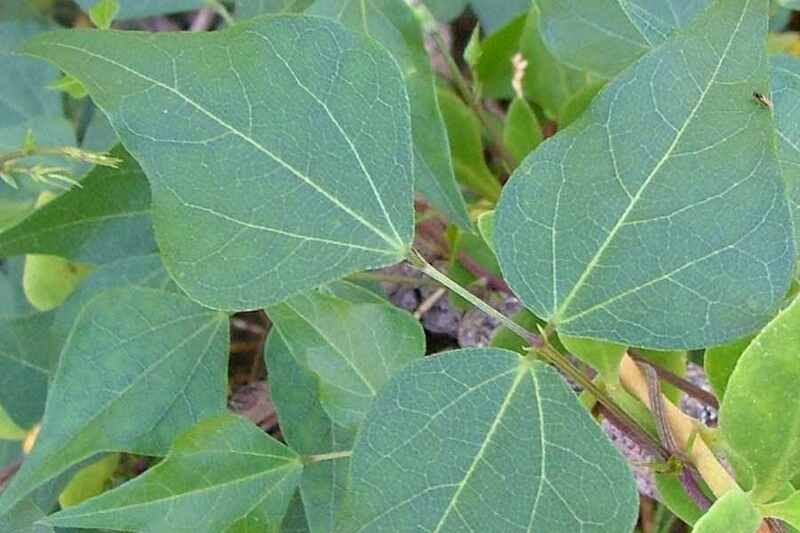 petioles) 3.5-8 cm long and are more or less hairless (i.e. glabrous or puberulent). The leaflets (3-10 cm long and 1.5-7 cm wide) are somewhat diamond-shaped (i.e. rhomboid) or egg-shaped in outline (i.e. ovate) and have pointed tips (i.e. acute or acuminate apices). Their margins are entire and there undersides are slightly paler. 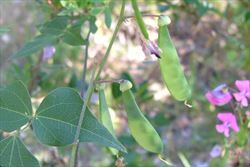 The pea-shaped flowers (10-16 mm long) are arranged in elongated clusters (up to 25 cm long) that emanate from the leaf forks (i.e. in axillary racemes). 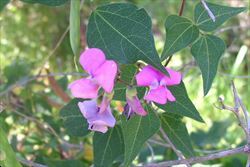 Each of the pink, purple or white flowers are borne on a narrow stalk (i.e. filiform pedicel) 3-10 mm long. They have five green sepals (3-4.5 mm long) that are fused into a tube (i.e. calyx tube) at the base. The uppermost petal (i.e. 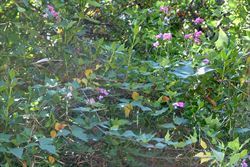 standard) is larger than the two side petals (i.e. lateral or wing petals), and the two lower petals are fused together into a single entity (i.e. a keel) and are folded lengthwise. These flowers also have ten stamens, with nine of these being fused together (i.e. connate) and one being separate. At the centre of the flower is an elongated ovary topped with a style, which is strongly curved inwards at the top and bottom, and stigma. Flowering occurs during spring and summer (i.e. from September to January). The pods are hairless (i.e. glabrous), flattened and somewhat sickle-shaped (i.e. falcate). 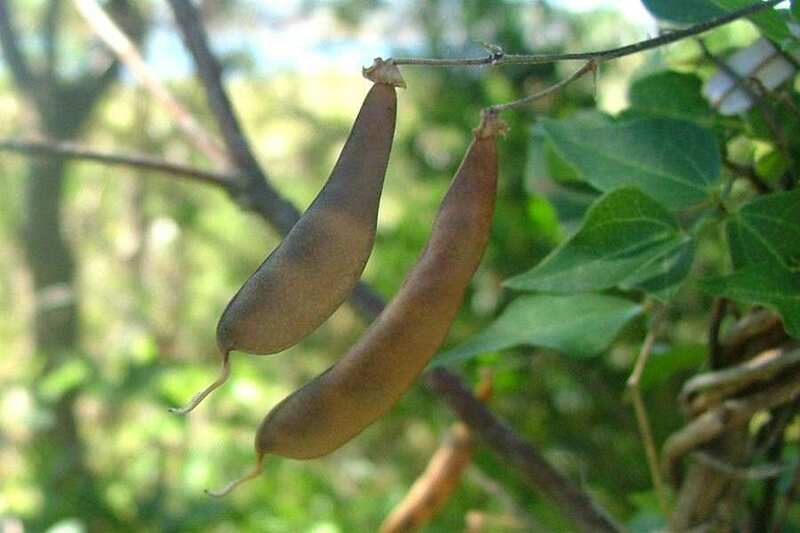 These pods (2-5 cm long and 5-10 mm wide) turn from green to brown as they mature and contain 3-6 seeds. 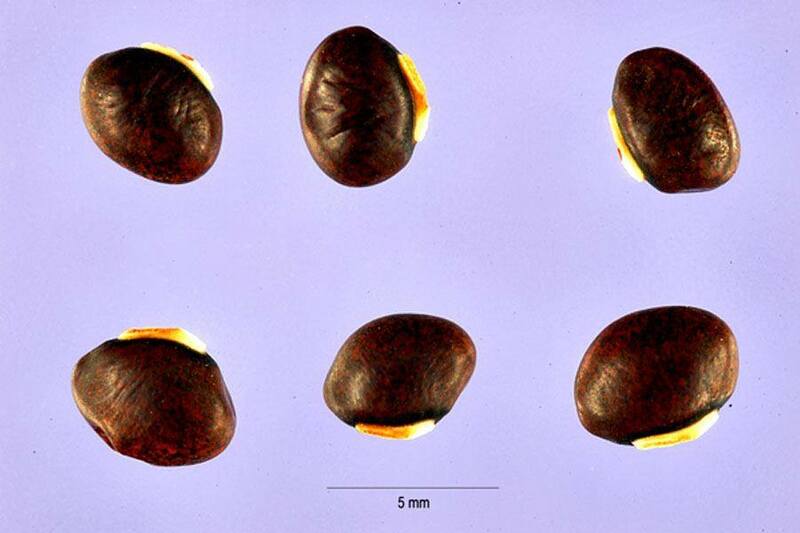 The seeds (3-4.5 mm long and 2.5-3 mm wide) are brown or black in colour with a conspicuous white spot (i.e. hilum). This species mainly reproduces by seed, which can remain dormant for several years. The seeds are often bird-dispersed and may also be spread in dumped garden waste. This species is regarded as a significant environmental weed in Victoria and as an environmental weed in New South Wales, South Australia, Tasmania and Western Australia. 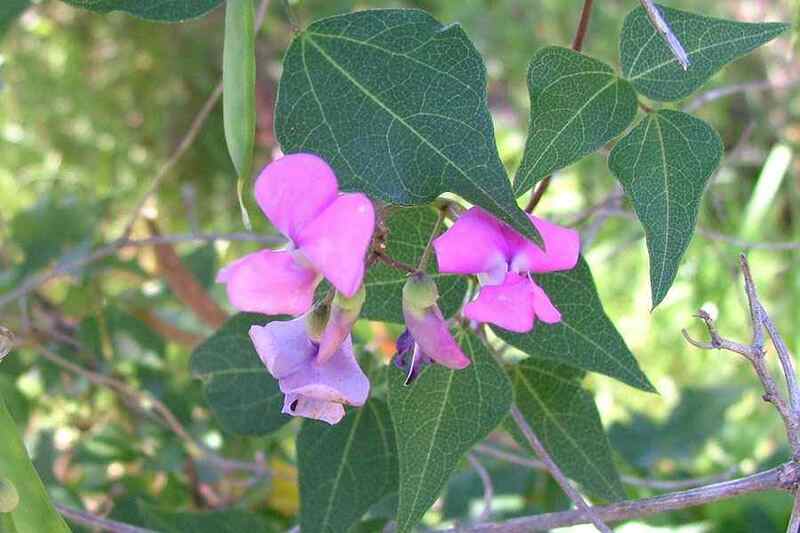 It was recently listed as a priority environmental weed in one Natural Resource Management region. Dolichos pea (Dipogon lignosus) can form dense infestations and in a relatively short period of time. 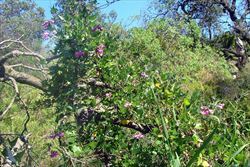 These infestations smother all other vegetation and prevent the regeneration of native shrubs and trees. It climbs over shrubs and trees, weighing them down and eventually causing them to collapse. 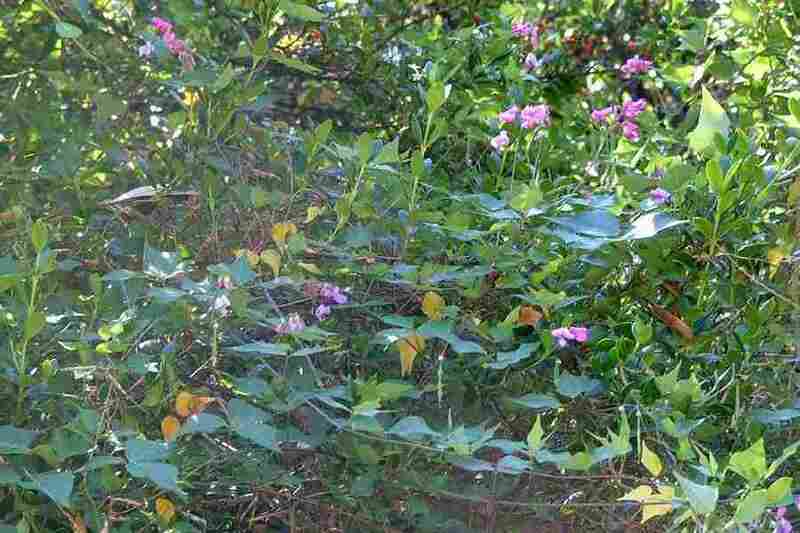 It can also spread across the ground, smothering any native groundcover plants that are present. As a nitrogen fixer, it can increase soil fertility and pave the way for other weeds to invade. It will invade both disturbed and undisturbed natural vegetation, and is of particular concern in coastal habitats. Not declared or considered noxious by any state government authorities. the Victorian Department of Primary Industries Coastal Note on this species, which is available online at http://www.dpi.vic.gov.au. dolichos pea (Dipogon lignosus) flowers have a curved style and its fruit are relatively small (2-5 cm long and 5-10 mm wide). lablab (Lablab purpureus) flowers have a straight style and its fruit are relatively large (50-140 mm long and 20-40 mm wide).